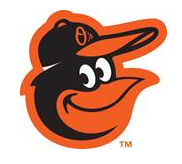 (Sarasota, FL) The Baltimore Orioles have announced plans for Opening Day of the 2016 Spring Training season, today March 2, when the O’s host the Atlanta Braves at 1:05 p.m. at Ed Smith Stadium. All fans in attendance will receive a 2016 Spring Training schedule magnet, courtesy of Visit Sarasota County. Additionally, the first 1,000 female fans in attendance will receive a bird of paradise flower, courtesy of Beneva Flowers. WWSB ABC7 anchor and managing editor Alan Cohn will throw out the ceremonial first pitch while anchor of “Good Morning Suncoast” Rebecca Vargas will perform the national anthem. The Sarasota Military Academy Cadet Color Guard will present the colors and Robin Fernandez will perform “God Bless America” prior to the seventh inning stretch. During pre-game ceremonies, each club’s manager and starters will be introduced and recognized along the first and third base foul lines. Reserve players and uniformed personnel will join the starters along both foul lines. Today and throughout the season, ballpark gates will open two hours prior to the scheduled first pitch. Season plan holders will be able to access the ballpark 15 minutes early through a dedicated entrance at the Home Plate Gate for all 16 home games, including Opening Day. Soft-sided and paper bags are permitted at Ed Smith Stadium, as long as they fit into a 16″ x 16″ x 8″ container. Hard-sided coolers, thermoses, glass bottles, cans, or alcoholic beverages are not permitted into the ballpark. All items permitted into the ballpark will be inspected. No bags or items exceeding the maximum size of 16″ x 16″ x 8″ are allowed into the ballpark. 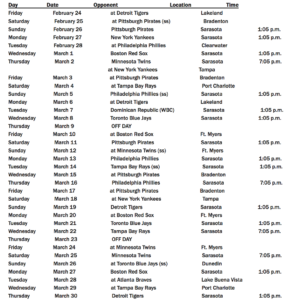 (Sarasota, FL) The Orioles today announced their 2016 Grapefruit League schedule, which opens Tuesday, March 1, with an away game in Lake Buena Vista, FL against the Atlanta Braves. The Orioles will open their home schedule the following day, Wednesday, March 2, with a 1:05 p.m. game against the Braves at Ed Smith Stadium in Sarasota. The Grapefruit League season will conclude with the club’s home-finale on Thursday, March 31, against the Braves. The 2016 season marks the seventh consecutive Spring Training season for the Orioles in Sarasota, and the sixth at renovated Ed Smith Stadium. Pitchers and catchers are scheduled to report to Ed Smith Stadium for camp on Thursday, February 18, with their first workout set for the following day. Position players are scheduled to report on Wednesday, February 23, with the first full-squad workout slated for Thursday, February 24. Fans are invited to watch the team’s workouts on the back fields at the complex each day. There is no charge to attend, and free parking is available. Baltimore will face eight different opponents during their 16-game home Grapefruit League campaign. The Orioles will host the Minnesota Twins and the Braves three times each and the Tampa Bay Rays, Boston Red Sox, New York Yankees, and Pittsburgh Pirates twice each. The Orioles will also square off against the Toronto Blue Jays and Philadelphia Phillies once each at Ed Smith Stadium. 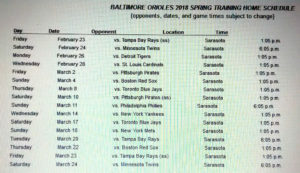 Additionally, the Orioles will play 16 games on the road during the Spring Training season. The team will make three trips to play the Twins; two trips to play the Rays, Blue Jays, Phillies, Red Sox, Yankees, and Pirates; and one trip to play the Braves. Single game tickets for all 16 games at Ed Smith Stadium will go on sale January 23, 2016. Fans interested in Season Plans, or those wishing to receive additional Spring Training ticket information, may call the Orioles Spring Training office in Sarasota at 941-893-6300. Fans interested in additional information on suite rentals or pre-game party facilities should call 941-893-6317. Additional information on Orioles Spring Training is available at www.orioles.com/spring. (Sarasota, FL) With last Friday’s crowd of 7,329 for the final home game of Orioles Spring Training at Ed Smith Stadium, the Baltimore Orioles have drawn a total of 112,258 fans for 15 home games in Sarasota this season. Since 2010, when the club’s Major League operations moved to Sarasota, 544,316 fans have enjoyed Spring Training baseball at Ed Smith Stadium.